Otters are a wonderful totem for nearly everyone, for they remind us how to be young again. They are simply a totem that represents laughter, joy,and playfulness. If you are needing to nurture your inner child, to explore those dreams that you have hidden away, and learn how to let go.....Otter will inspire you. So often we go day after day working in the usual grind, managing our multi tasking and crossing things of our lists that soon we find night has arrived and we somehow didn't have anytime for ourselves. 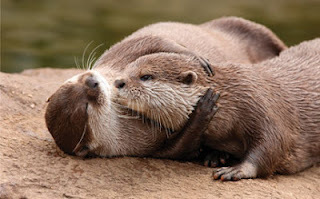 Otters teach us to enjoy each day to the fullest, to treasure every moment, and smile. They are a confirmation that laughter is the best medicine. You will find that when you learn how to immerse yourself in happiness, you not only help yourself but others as well by exuding such joyful energy. Earth Day became a recognized day quite some time ago. It becomes more and more popular each year as our global family becomes increasingly aware of it's importance and the things that we can do to give back to the land. I stay in tune with it every day...trying to stay aware of my footprints on the Earth and how all of our choices have an effect on something else. But it's more than that for me, for it feeds my soul. Respecting the land that we live on has become a part of my spirituality. Honoring the cycles of life, death and rebirth, and the seasons, correlates with all aspects of the spirit. My personal growth can run parallel to that of my surroundings. I find more solace in nature than in a self help book. When days run into each other and monotony sets in, things can feel stagnant. As soon as you step outside and are aware, you can feel how immense the universe is, how there is truly an abundance in life to draw from, and manifesting seems so much more possible. Somehow all of those little things that we stress on, that snowball and become big things that we stress on...are more easily put in perspective when you allow your feet to feel the Earth again. I am always impressed with the mood changes Earth has...she can shift from serene and calming, to intense and passionate, to angry and tantrums....so much like us humans who walk upon her. And you realize...it will change. It always does. Nothing stays the same. Maybe those large entities that take her for granted, who dump and pillage her resources out of greed, somehow lost touch with her long ago. I think they forgot how to see, feel and touch life. My hope is that one day they can remember...how it feels to have a bird in the hand, to nurture something as it grows, to feel the breeze on your face, or to be in awe of it's immense beauty and strength. I hope that everyone has a meaningful Earth Day, and maybe you can share with someone else it's importance, and one by one we can change our responsibility level. Nature, our Earth, is reflected in all of my art work, because of it's simple importance in my life. My hope has always been that when it is shared with others.....it raises their awareness as well. Sometimes you need to change it up a bit....explore a different place...dabble in areas where you don't usually play. It stirs the pot of inspiration, pulling more ideas into your artful spirit. Recently I created a piece for a call/challenge that asked for a piece that was Edgar Allan Poe inspired. This intrigued me, but which piece of his work would be the source of my focus? I wanted to choose a story that was different than the ones that immediately come to mind. So after perusing many Poe stories and poems I decided on "The System of Dr. Tarr and Professor Fether" that was published in 1856. I was quickly drawn into the story, soaking up each word, allowing his master of the word to draw me into the journey through Southern France and the antics at the Maison de Sante. The characters described in the story peeked my interest and so for this piece I portrayed three of them standing outside...standing inside...the Maison de Sante. So many scenes I could have portrayed but truly the thing that had set the mood for me in the story was the feel of the Maison as the visitor was making his journey there and how it would have felt from the outside looking in. I loved doing the challenge, exploring a piece of literature and portraying it with my hands. 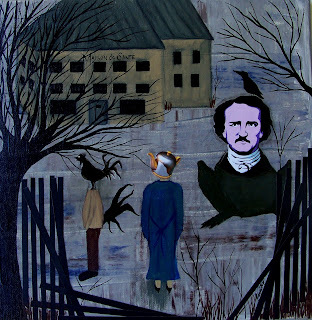 And of course, if you haven't read this particular story of Edgar Allan's I encourage you to do so. A lovely read for a Saturday afternoon. Every piece of Art that I create has special meaning for me. I suppose that I just couldn't create something because I felt that it was "marketable" or the current trend. I create from my heart and my gut, subjects that I am engaged with. There is always a personal reason for each of my works and I trust that each creation will find the home that it is meant for...that it's meaning which is special to me also becomes important for someone else on their journey. 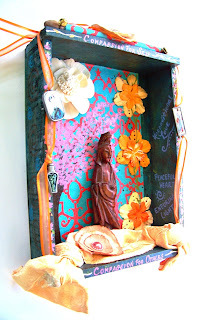 One evening this week while I was journaling, I was inspired to create more shrines. It has been a long time since I had created any and it was time once again. Immediately I knew that Kuan Yin needed to be the focus in the first one. 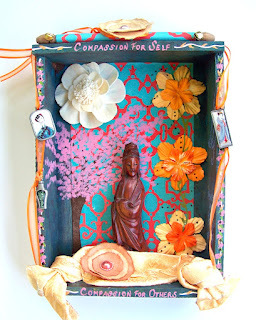 Kuan Yin, the goddess of Compassion has always held a tender place in my heart. This healing shrine needed to embody compassion, to be a reminder not only to offer compassion to others, but to the Self. So many times we put ourselves at the bottom of our priority lists. We play catch-up with our needs, giving ourselves a little tenderness when it is usually long over due, and then it's not usually enough. How can we expect others to treat us with compassion when we don't give it to ourselves? And so the assemblage began, with complete and focused love. 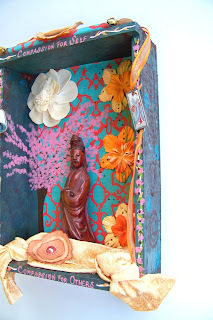 As soft music played and the smell of jasmine in the air, I worked...colors of turquoise and peach, soft rose and periwinkle started to cover the shrine.Various phrases were painted on the insides, charms were hung, paper flowers attached...all within a meditative mood. The wooden statue of Kuan Yin was secured to the shrine with soft pale yellow silk fabric flowing around her. My hope is for whatever sweet soul comes to collect this healing shrine, they too will be reminded to nurture and protect their spirit, and to show compassion and love to Themselves and Others. This shrine has been SOLD. This week we had a visit from a Mallard Duck, inspiring me to share their symbolic meaning with you. Our visitor was a male Mallard, beautiful in his blue green colors. He happened to just come walking through our woodland tree line and across the yard to our home. As my husband and I were sitting on our porch, we were intrigued and watched with curiosity at this little guy. At first when he arrived, he took a walk down our driveway, slowly turning from left to right as he walked, looking into the woods as if he was looking for something. We thought by chance maybe he was looking for his mate? (Just prior we had had a blustery thunderstorm and wondered if he had gotten blown off course). Mallards don't mate for life, but they do mate for the season. Once he got to the end of the driveway he walked back up toward our home, purposeful, directly for the porch. He had no fear of humans, he was quite comfortable in fact. He was attracted to our front porch, and the flower beds planted around it. He spent a few hours walking around it, looking at us, looking at the flowers, and behaved as if he had been here all of his life. Mallards imprint very easily and are very sociable. They don't like to be alone. This is something to look at if you have a duck for a totem ~ they reference to the need to be around those of like mind, where you feel comfortable and safe. This mallard certainly felt safe with us. He spent plenty of time meandering around our porch listening to us talk, watching us water the flowers, even watching our dog who was enjoying her afternoon on the porch. And as evening approached, the mallard stayed on. Surprising us by walking up the porch steps and directly to our screen door. There he stood, for at least a half hour, as if waiting for someone to answer the door and let him in. We were amazed with his presence, continued watching, until finally we needed to go back inside for the evening. Several times we looked at the window, only to find him still standing on the porch. He would take breaks and walk back down the steps to a nearby rain puddle, stand in it and drink the waters, then return to the porch. When morning arrived, I immediately went to the door to see if our visitor was still with us...and he was. He continued to spend time with us that morning, grazing for food in the moss near our trees, and then back to the rain puddles. He made many trips up and down the steps of the porch, talking all the while...until finally as the sun was shining brightly he walked to the end of the porch and flew off. Now of course me, who always feels that there is a reason for everything, and finds a deeper meaning in life's actions, pondered on why this little guy came to visit. I think he was a reminder...a reminder that no matter what is going on in the world, what challenges you face, find solace in those loving spirits in your life who are kind, bring you comfort, and make you feel safe. Because in the end...it's all about the love. I have been spending a great deal of time thinking on our Earth and how our progress has changed not only our society, but the effects it has had on our world. This is what had inspired my most recent painting "The Adaptation of Gaia". Looking back through history and at the changes, growth, and progressions we have made, one has to wonder...have the changes been made in a responsible way? (Well, certainly not.) Has Greed won out over the long term changes we have placed on this world we live in? I marvel at Mother Earth's flexibility, and her ability to adapt. Though I know that everything has their breaking point, a point where something can only bend so much before it in fact will break. My hope is that big business, corporations, and those in authority will begin to factor the future into their decision making. That the all mighty dollar will not control every venture, and that on a global level our Earth, our basis of life, will become of high importance once again. In ancient Greek religion, Gaia was known to be the great mother to all, Mother Earth. Here in my painting, I have created Gaia, rising from the Earth. Atop her head, symbolically for atop our world, is the industrialization of our society..the architecture of our inventions. Freeways and roads intertwine through her hair. Her balance of earth and sky, and the appearance of vines and leaves growing on top of....in spite of....is her adaptation to the change. Here I am portraying the fragile balance of our Earth and our Progress as Humans, both valued. My hope it that more conscious thought be placed on keeping a balance. With the arrival of Spring, and my personal journey of healing and peace within, I have been spending considerable time outdoors in our woods and forests. 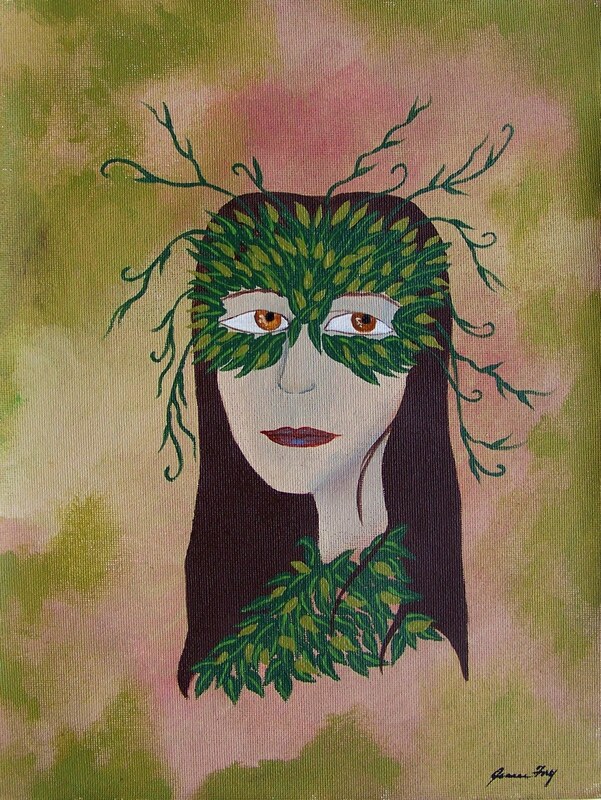 Always carrying a camera or a sketchbook, inspiration fills me after my walks, and that is where my most recent painting of Greenwoman came. Masks and Wings have become prevalent in my artwork these past few months, and so this is a first in a new series I am creating. I am attracted to the concept of the masks and wings, maybe because they are tools.....tools to take us to another place...tools to take us Within. They allow us to go where we want to go, be seen when we want to be seen, and free us to be who we are. Greenwoman has always been special to me, representing to me a woman's connection with the Earth.